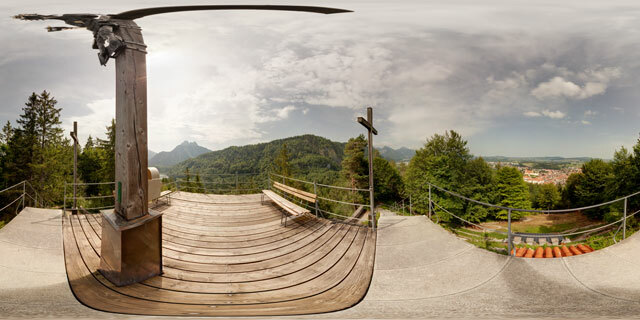 360° VR panorama taken on the Alpenrosenweg, near Füssen, Bavaria. 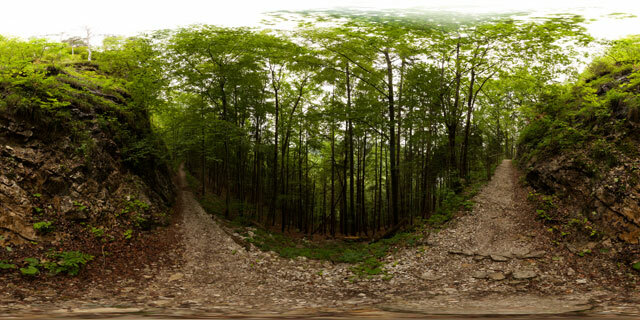 The Alpenrosenweg is a footpath that runs between Ziegelwies and Hohenschwangau, running along the north side of the heavily forested Schwarzenberg. It is a popular walking route as part of a round trip from Füssen to Hohenschwangau. 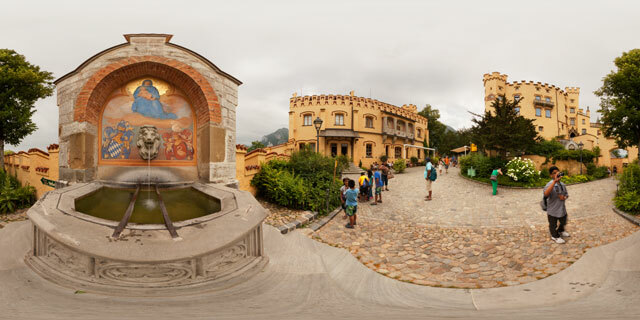 360° VR panorama by the water fountain in the yard of Schloss Hohenschwangau, Bavaria. The fountain features a painting of Mary holding the baby Jesus. Below this are the coats of arms of Bayern and Schwangau. In the centre at the bottom of the painting is the fountain, which is modelled as a lion’s head, with the water coming from its mouth. Schloss Hohenschwangau was built by King Maximilian II of Bavaria. Construction started in 1832, with the majority of construction complete by 1837. The castle was used by the King as his Summer residence. Today the castle acts as a museum / tourist attraction. Around 300,000 people visit the castle each year. 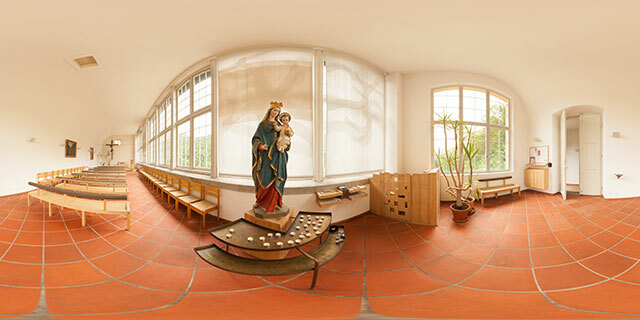 360° VR panorama of inside the Chapel of Christ the King at Hohenschwangau in Bavaria, Germany. The chapel is situated just to the east of Schloss Hohenschwangau, and was previously used as the castle’s orangery before being converted into a chapel. The Castle Chapel of Christ the King (Schlosskapelle Christkönig) is designed to be a clear bright space of calm and composure. 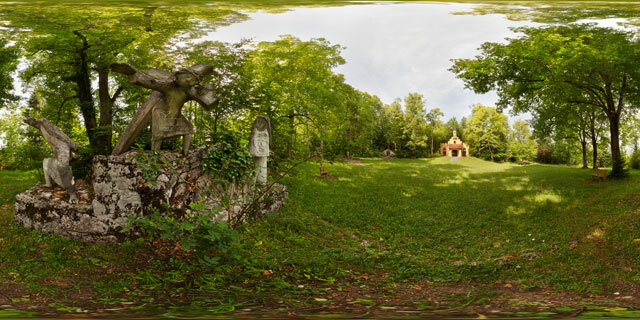 At the rear of the chapel is a statue of the Virgin Mary (Gottesmutter Maria) holding the baby Jesus. In one hand Jesus holds a globus cruciger (reichsapfel), while his other hand is held up to give a blessing. By the statue’s feet are a number of lit prayer candles. At the front of the chapel is a wooden altar and an 18th century Tyrolean crucifix. On the walls are a couple of framed religious paintings. Regular services are held at the chapel, every Friday at 6pm in the summer, or 5pm in the winter.